After you add a list of tasks, you may want to insert some blank rows to delimit some phases in your project or for any visual arrangements. You can insert blank rows above a selected row. To insert a single row, select the whole row above which you want to insert the new row. For example, to insert a new row above row 5, select Id cell in row 5. To insert multiple rows, select the rows above which you want to insert rows. Select the same number of rows as you want to insert. For example, to insert three new rows, you need to select three rows. 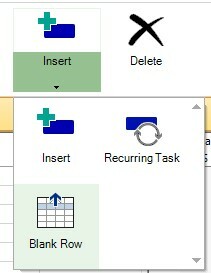 Go on Task menu and from there, press on the drop down underneath Insert menu option and select Blank row. In this way, you will insert in your project a blank row above the selected row/cell. As you can notice, Project Plan 365 will create a null/blank task which has associated an ID, but it won't contain any other data (i.e. Task Name, Duration, Start, etc.) unless you enter it.